Life is serious, and full, and beautiful. In art one is usually totally alone with oneself. I feel a burning desire to become grand in simplicity. I am constantly observing things and believe that I am coming closer to beauty. I am becoming something — I am living the most intensely happy time of my life. The intensity with which a subject is grasped - that is what makes for beauty in art. Last year I wrote:'the intensity with which a subject is grasped, that is what makes for beauty in art'. Isn't it also true for love? 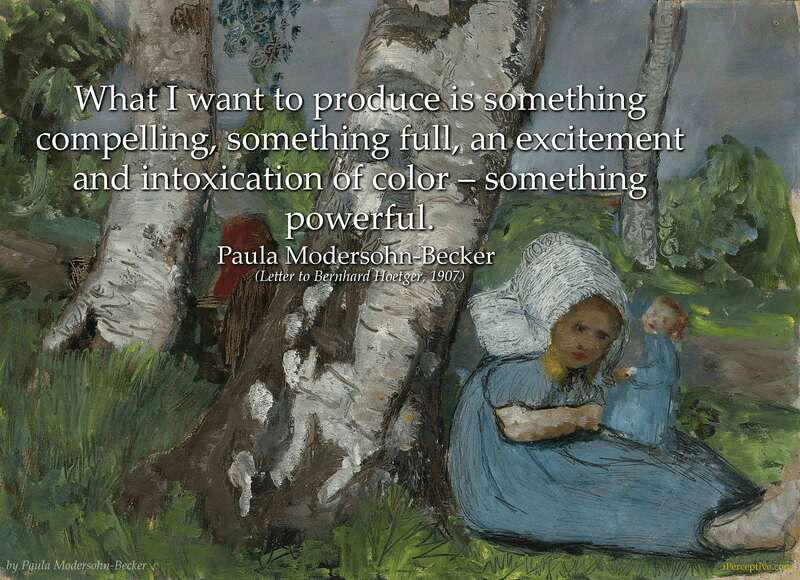 What I want to produce is something compelling, something full, an excitement and intoxication of color – something powerful. I think the time is coming for struggle and uncertainty. It comes into every serious and beautiful life. I knew all along that it had to come. How happy I would be if I could give figurative expression to the unconscious feeling that often murmurs so softly and sweetly within me. I cannot come back to you. Not yet.. .I do not yet want to have a child by you. I must wait, if it comes again, or if something else comes out of it.. Nature is supposed to become greater to me than people. It ought to speak louder from me. I should feel small in the face of nature's enormity. I want to go further and further. I can hardly wait until I am a real artist. And then I long so for life. I've only begun to get a little taste of it. We cleave to the past too much in Germany. All of our German art is too bogged down in the conventional... I think more highly of a free person who consciously puts convention aside. I must learn to express the gentle vibration of things: the intrinsically rough texture. I must find this expression in drawings; in the way in which I draw my nudes here in Paris, more original and at the same time sensitively observed. Nature is supposed to become greater to me than people. It ought to speak louder from me. I should feel small in the face of nature's enormity. That is the way Mac- kensen thinks it should be. That is the alpha and omega of all his critique. What I should learn, he says, is a more devout representation of nature. It seems that I let my own insignificant person step to the forefront too much. I am constantly observing things and believe that I am coming closer to beauty. In the last few days I have discovered form and have been thinking much about it. Until now I've had no real feeling for the antique. I could find it very beautiful by itself. But I could never find any thread leading from it to modern art. Now I've found it, and that’s what I believe is called progress. I know I shall not live very long. But why is that so sad? Is a festival more beautiful because it lasts longer? My sensuous perceptions grow sharper, as if I were supposed to take in everything with the few years that will be offered to me ... And now love will still blossom for me before I depart, and if I've painted three good pictures, then I shall leave gladly with flowers in my hand and my hair. I believe that one should not think so much about nature when painting, at least not during the conception of the picture. Make the color sketch exactly as one has felt something in nature. But my personal feeling is the main thing. Once I have established it, lucid in tone and color, I must bring in from nature the things that make my painting seem natural, so that a layman will only think that 1 have painted it from nature. It is my experience that marriage does not make one happier. It destroys the illusion that has been the essence of one's previous existence, that there existed something like a soul-mate. The feeling of not being understood is heightened in marriage by the fact that one's entire life beforehand had the aim of finding a being who would understand one. But isn't it better to exist without such an illusion and look this great lonely truth straight in the eye? This past summer I realized that I am not the sort of woman to stand alone in life. Apart from the eternal worries about money, it is precisely the freedom I have had which was able to lure me away from myself. I would so much like to get to the point where I can create something that is me. It is up to the future to determine for us whether I'm acting bravely or not. The main thing now is peace and quiet for my work, and I have that most of all when I am at Otto Modersohn's side. Isn't love thousandfold? Isn't it like the sun that shines on everything? Must love be stingy? Must love give everything to one person and take from the others.. .I don't know much about the two of you [ Rilke and Clara ]; but it seems to me that you have shed too much of your old self and spread it out like a cloak so that your king [Rilke] can walk on it. I wish for your sake and for the world and for art [Clara is sculptress] and also for my sake that you would wear your own golden cape again.. If I could really paint! A month ago I was so sure of what I wanted. Inside me I saw it out there, walked around with it like a queen, and was blissful. Now the veils have fallen again, gray veils, hiding the whole idea of me. I stand like a beggar at the door, shivering in the cold, pleading to be let in. It is hard to move patiently, step by step, when one is young and demanding.. .I walk along the boulevards [Paris] and crowds of people pass by and something inside me cries out, 'I still have such beautiful things before me. None of you, not one, has such things'. And then it cries, 'When will it come? Soon? Worpswede, Worpswede, I cannot get you out of my mind. There was such atmosphere there – right down to the tips of your toes. Your magnificent pine trees! I call them my men – thick, gnarled, powerful, and tall – and yet with the most delicate nerves and fibers in them. That is my image of the ideal artist. And your birch trees – delicate, slender young virgins who delight the eyes. With that relaxed and dreamy face, as if life had not really begun for them.. .But then there are some already masculine and bold, with strong and straight trunks. Those are my 'Modern women'. And you willows, with your knotty trunks.. .You are my old men with silver beards. I have company enough, indeed I do, and it's my own private company. We understand each other well and nod friendly answers back and forth. Life, life, life! 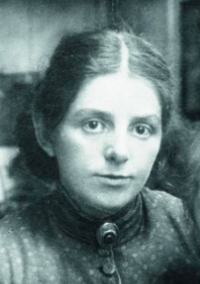 Paula Modersohn-Becker was a German painter and artist who is best known for her prominent role in expressionism. She is also known for being one of the first women to paint naked self-portraits.